Come hear some amazing life-affirming drums and heartfelt poems for the PLANET. Performances by the UBER-talented DAN JOHNSON & ARUL KARTTIKEYA. This event is brought to you by Bainy Suri and Sustainable Princeton. For tickets, please see the EventBrite link below. SUGGESTED DONATION $10.00. For more information contact bainysuri@gmail.com. All funds will be used to promote Sustainable Princeton's BYOBag Campaign. Members of Princeton University’s Class of 2015 were given a "Sustainability Survival Kit" when they arrived on campus this year. The University’s Office of Sustainability collaborated with Sustainable Princeton’s BYOBag Campaign over the summer months as the contents of the kits were developed. A reusable nylon shopping bag that unfolds from its own compact pouch. Listed in handsome orange printing on each side of the black bag are campus retail spots and BYOBag Businesses who are striving to reduce their use of plastic bags. Sustainable Princeton hopes that students will use their nylon bags in place of single-use plastic bags whenever possible. 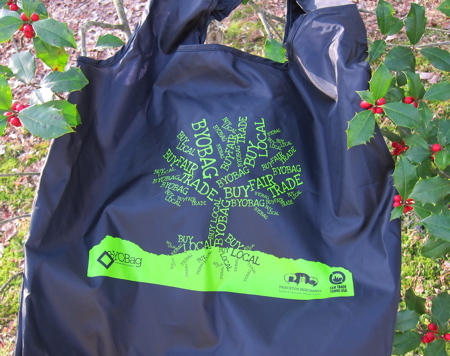 The bags will also help bring attention to Sustainable Princeton's BYOBag Businesses and the BYOBag Campaign.